Cover: Soldiers marching on Twelfth (Flagler), Street in 1917. Miami residents woke up to a perfect fall day on Monday, November 11, 1918, as they prepared for the start of a new week. The low in the morning was sixty-eight degrees and the day would top off at eighty-degrees with low humidity and plenty of sunshine. However, people around the world were still living under the cloud of war taking place in Europe. The United States entered World War I, also known as the Great War, more than a year and half earlier, and its citizens were anxious for the war to come to a victorious conclusion. Given the sacrifice all Americans were making, everyone was ready to move on from a conflict that seemed so far away. Miamians were no different. Although the city and region benefited from the increase in tourism due to the conflict in Europe, South Floridians were ready for good news. On a beautiful Monday morning in November, they would get that news. 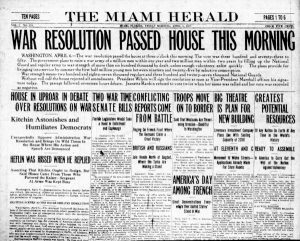 Figure 1: Miami Herald headline of declaration of war on April 6, 1917. Although the Great War officially began in Europe on Miami’s birthday (July 28), in 1914, the United States did not enter the war until Congress passed a war resolution on April 6, 1917. The State of Florida would play a prominent role in preparing soldiers for battle in Europe. In particular, the state became host of several air fields used to train pilots for the war effort. After war was declared, the United States Congress appropriated funds to establish flight schools throughout the country. 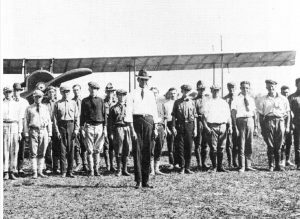 In November of 1917, Glenn Curtiss identified a location on Miami Beach for a hydro-airplane school and a second location in the Everglades for a land-based flight field. Curtiss’ plan was to have the largest Army aviation school in the country. He originally leased land from the Bright Brothers for his land-based training school. The property for the school later became part of the future city of Hialeah. Within a year of opening the school, he moved it to fifty acres of land he purchased just north of the Miami Canal. In Coconut Grove, the Navy took over Dinner Key and established the U.S. Naval Air Station in 1917. They filled in the key and built a training facility to teach naval airmen how to fly hydro-planes. The facility closed shortly after the conclusion of the war due to complaints from Coconut Grove residents. Figure 2: Curtiss Flight School in 1917. Dinner Key was used as a commercial airport until the Second World War when it was once again commandeered by the Navy. Just prior to and then after the war, Pan American Airlines operated out of Dinner Key until they moved to Miami International Airport. The former main terminal building for Pan American is now used as Miami City Hall. The United States Coast Guard established their Air Station on Dinner Key more than a decade after World War I. The station operated in Coconut Grove from 1932 until 1965, when it moved to the Opa-Locka Airport. The former barracks, mess hall and hangar were all later added to U.S. Register of National Historic Places. Chapman Field opened in late summer of 1918. It was named for the first American pilot killed during World War 1, Victor Chapman. It was used briefly as a target range by army pilots flying bi-planes to practice aerial gunnery. However, the war ended shortly after the base got up and running. The land was given to the Department of Agriculture after the war, and it was where David Fairchild introduced new plants and trees to the country. It was the replacement for the experimental station that was in Brickell from 1898 until the early 1920s. The land is now part of a 483-acre park called Chapman Field Park at 13601 Old Cutler Road. 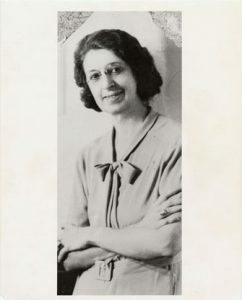 Figure 3: Marjory Stoneman Douglas. In 1917, Marjory Stoneman Douglas was working for the Miami Herald when she was asked to cover a story about the first woman in Miami to enlist for the war. However, when she arrived at the naval enlistment office, the woman never showed up. Given the opportunity to be the subject of the story she was asked to report, Douglas decided to volunteer and took the distinction as the first woman in Miami to enlist for service for the Great War. Initially, she served as Navy Yeoman First Class and was responsible for administering boat licenses in her home town. It was said that she disliked having to wake up early, and that she would regularly correct the grammar of many of the officers, which did not endear her to her commanders. She requested, and was granted, a discharge and then joined the Red Cross. During her time with the Red Cross she was deployed to Europe where she wrote publicity articles for the organization. At the time that the Armistice was announced in 1918, Douglas was in Paris, where she witnessed the jubilant celebrations as the announcement spread throughout crowds on the street. Before she returned home from Europe, she cared for war refugees. She said that her experience working with the refugees in Paris helped her understand the plight of migrants that settled in Miami many decades later. Figure 4: Miami Daily Metropolis Headline on November 11, 1918. After negotiations between the Allies of World War I and Germany, a cease fire was ordered to take place on the eleventh hour on the eleventh day of the eleventh month in 1918 (November 11, 1918). The cease fire, or armistice, was initially set to expire after thirty-six days, but it was extended long enough until a formal treaty could be reached the following year. At the time of the Armistice, less than half of Miami residents had phones and commercial radio was not available for a few more years. When it was confirmed that there was a cease-fire in Europe, the news traveled quickly and organically throughout the city. Beginning at 3 am eastern time on November 11th, word got out about the cease fire. The Miami Fire Department provided a continuous blowing of their sirens and fired a small canon multiple times to make everyone within ear shot aware of the announcement. The news was spread by boat whistle, church bells, and car horns which made everyone outside of the city aware that the war had ended. As the word spread throughout the city, Miami residents flooded the streets to celebrate by banging pots and dancing with neighbors and strangers alike. 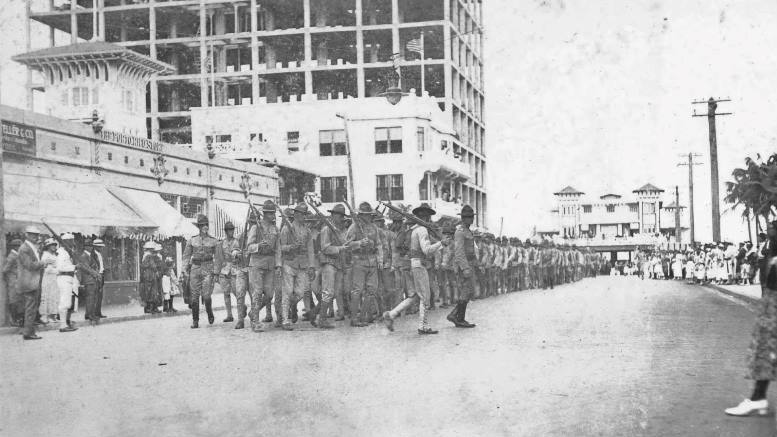 Figure 5: Armistice Day Celebration in downtown Miami on November 11, 1918. Shortly after daylight, residents participated in impromptu parades consisting of makeshift floats and marching bands to celebrate the great victory. 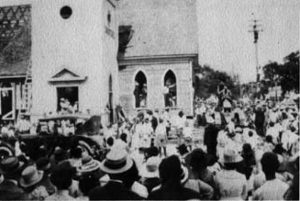 A parade organized by black residents from Overtown made its way into downtown and onto Flagler Street with a float depicting a dummy dressed in a “striped convict suit”, with a noose around its neck and a sign on its chest that simply read “Kaiser”. The float stopped in front of the Dade County Courthouse long enough to burn the dummy. Several of these impromptu parades passed by the Miami Metropolis building which led one writer to call Miami’s spontaneous response as the “world’s greatest party”. The city’s politicians also joined the celebration. Everest G. Sewell, the president of the Chamber of Commerce and a future two-time Mayor of Miami, dressed up as Uncle Sam and glad handed everyone within his reach. Figure 6: Armistice Day Parade in November, 1918. Despite the apparent finality of the armistice, there was still a lot of work to be done. A treaty needed to be negotiated and the soldiers had to be brought back home. Many soldiers remained in Europe providing help to the war-ravaged areas and to ensure that the treaty got signed. These activities required funding. Even though the war was over, money to pay for post-war activities still required help from those back home. The first initiative was called the United War Fund Campaign. It kicked off immediately after Armistice Day when a stunt flier from Dinner Key flew over Royal Palm Park in downtown Miami to generate attention for the start of the campaign. However, the stunt pilot barely averted trouble when it just missed flying into the flagstaff of the bandshell in the park. It forced him to have to land his plane in Biscayne Bay adjacent to the park. Dade County’s goal was to generate $95,000 and fund-raising activities included participants of all ages. Victory Boys and Victory Girls clubs were organized to raise five dollars per child. They had to work for the pledge and not solicit it from their parents or others. The students were part of a parade on November 12 that traveled down today’s Flagler Street and included the Naval Air Station band. The entire war fund goal was reached within three months. Figure 7: United Methodist Church demolition in May of 1919. In addition to the war fund campaign, Miami also contributed to the post-war effort by joining a nationwide program to raise money through a final bond drive. During the war, there were ongoing programs to sell bonds to help pay for the war. The Victory Bond Drive was a final push to help raise enough money to bring the boys back home from Europe. Miami’s goal was to raise one million dollars as part of this initiative. The final effort to ensure the city met its goal was a staged gimmick of a Whippet Tank destroying one of Miami’s early churches. The Methodist Episcopal, at Northeast corner of Avenue C and Tenth Street (today’s NE Fourth Street & NE First Avenue), scheduled the demolition of their current building to replace it with a newer structure. The removal of the building was planned, but the church members thought that the gimmick would be a good way of tying the demolition to the bond drive. Purchasers of a five-hundred-dollar bond could operate the tank or bulldozer, while it made one its passes at the church. However, the Dade County pine built building was stubborn and it required a professional’s touch. It took three tries before it broke through the first wall. By the end of the day, the old church was a pile of debris. The replacement building became the White Temple Church. The gimmick worked as it attracted thousands of people to watch the demolition. Volunteers used the opportunity to canvass the crowd and sell additional bonds to those in attendance. 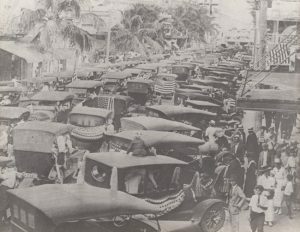 The event allowed Miami to achieve its goal of raising one million dollars by its deadline of May 11, 1919. 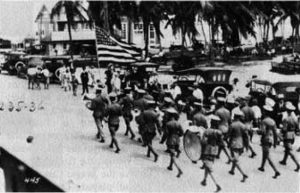 On the day it reached its goal, Miami conducted its largest war parade to celebrate the accomplishment. The procession was referred to as the Victory Day Parade. Figure 8: Victory Day Parade on May 11, 1919. World War I came to an official end when the Allied Nations and Germany signed the Treaty of Versailles on June 28, 1919. The treaty was signed exactly five years after the assassination of Archduke Franz Ferdinand, which led to the Great War. Although Armistice Day ended the actual fighting, it took six months of negotiations between Allied powers at the Paris Peace Conference to finalize the treaty. While World War I was called the “war to end all wars”, many historians believe that the Treaty of Versailles only paused a war that continued two decades later as World War II. While Armistice Day was informally acknowledged on the anniversary of the cease-fire each year after 1918, it wasn’t until June 4, 1926 that the date was formally recognized when the United States Congress issued a proclamation to observe Armistice Day with “appropriate ceremonies”. However, it wasn’t until a Congressional Act, which was approved on May 13, 1938, that Armistice Day was made a legal U.S. holiday. The holiday was later expanded to observe the contributions of all veterans as part of Veterans Day, which is how the United States observes Armistice Day today. South Florida History Magazine: “The Curtiss Flying School” by Donald C. Gaby. Summer of 1991. Update: “Jubilation The War is Over!” by Thelma Peters. October 1975. Book: “Everglades River of Grass”, by Marjory Stoneman Douglas & Michael Grunwald. Cover: Soldiers marching on Twelfth (Flagler), Street in 1917. Courtesy of George Cook. Figure 1: Miami Herald headline of declaration of war on April 6, 1917. Courtesy of Miami Herald. Figure 2: Curtiss Flight School in 1917. Courtesy of HistoryMiami. Figure 3: Marjory Stoneman Douglas. Courtesy of University of Miami Digital Archives. Figure 4: Miami Daily Metropolis Headline on November 11, 1918. Courtesy of the Miami News Archive. 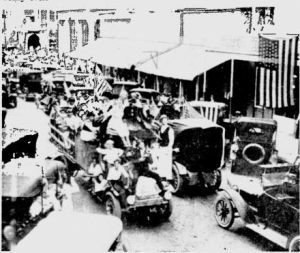 Figure 5: Armistice Day Celebration in downtown Miami on November 11, 1918. Courtesy of Dr. Paul S. George. Figure 6: Armistice Day Parade in November of 1918. Courtesy of the Miami News Archive. Figure 7: United Methodist Church demolition in May of 1919. Courtesy of HistoryMiami. Matlack Collection. Figure 8: Victory Day Parade on May 11, 1919. Courtesy of HistoryMiami. Matlack Collection. 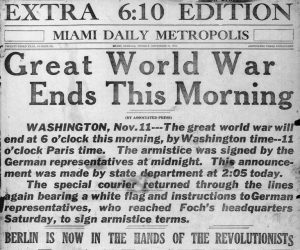 Be the first to comment on "Armistice Day in Miami (1918)"